Whether you are a DIY bride or not I think it’s time to really examine the differences between having fresh flowers and silks for a wedding. Both do have attributes that would make either, a viable choice for an event. There are some common misconceptions that should be looked at when making the decision between the two. Everyone is concerned about cost. Whether a big budget wedding or intimate event, bottom line is often based on price. A common misconception is that silk flowers are less expensive than fresh. The truth is that high quality silks can cost upwards of $3-5.00 a stem. An average bridal bouquet has 20-25 stems so at those prices, the cost of just that one bridal bouquet could run somewhere between $75 & $125 . An average wedding party having 1 maid of honor and 2 bridesmaids, as well as boutonnieres could be in the $300-350 range, just for the wedding party silks. If you were to look at that in comparison to ordering flowers from Brides N Blooms wholesale division, just as an example, you would be able to purchase 250 stems of roses for that same $300. (including delivery). That would give you enough roses to do the whole wedding party bouquets and boutonnieres, as well a enough to do at least 10 tables worth of rose bowl flower centerpieces. Color options can be tricky with both silks & fresh. If a bride is set on a color that must be an absolute match to something, does not necessarily grow in nature, or is hard to come by at a certain time of the year. I’ve noticed many times, when a bride is trying to decide on a color, they tend to become short sighted and not see the bigger picture. With fresh flowers there are tricks employed to match flower colors and in understanding how the eye and mind processes it. Take, for example, a color scheme of Tiffany Blue and Silver. You do not need to have a Tiffany blue flower to accent and match in a fresh flower bouquet. Adding in a contrasting color to pop and including some flowers in a similar blue tone, makes a statement, coordinates well with your colors, and in your mind’s eye appears to match perfectly. Take a look at these examples! This bouquet has an array of peach, pale blue & white flowers. It is accented with blue/green eucalyptus greenery. Nothing in this bouquet is Tiffany blue, but set against that color background your eye would automatically ‘see’ it as Tiffany blue. 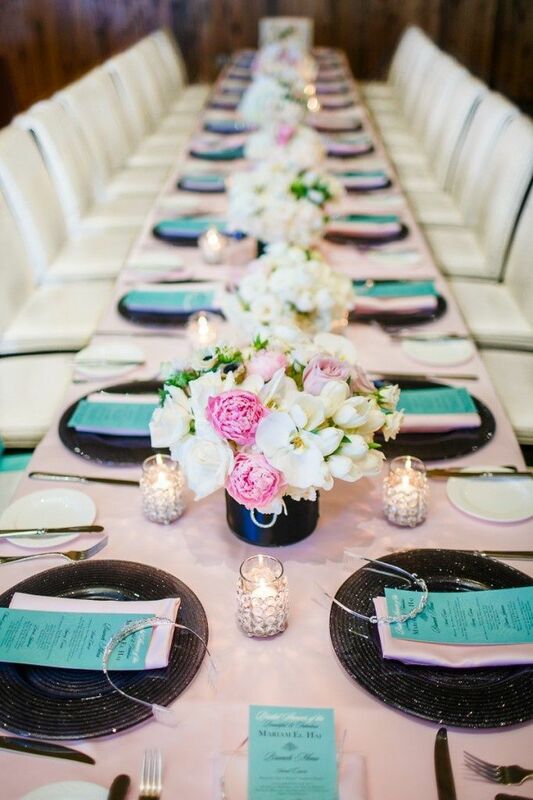 These table settings have just a small amount of pink as a coordinating color and it makes the Tiffany blue color pop! One other question we’ve been asked is: “Can I mix silk and fresh together in my bouquet?”. The answer is YES! You can!! We have done that for a number of our clients. We do, however, require that the silks be of high quality and that they are accent flowers, not the main focal flower. Again, the eye will assume them to be real, if it is not overpowering the design. Can you pick out the silks in these two designs? Whichever your choice, always ask for pricing up front. Remember there’s one thing that that fresh flowers excel in… they are beautiful, and even the best silk flowers cannot duplicate the look of a live orchid or the scent of a real rose. Now go out and have yourself a wholesale, fresh flower day! My husband and I took a cruise to a couple of the Caribbean Islands. Two of my favorite things about our visit was the endless blue green water… and the flowers! One of the islands we stopped at was St. Maarten. 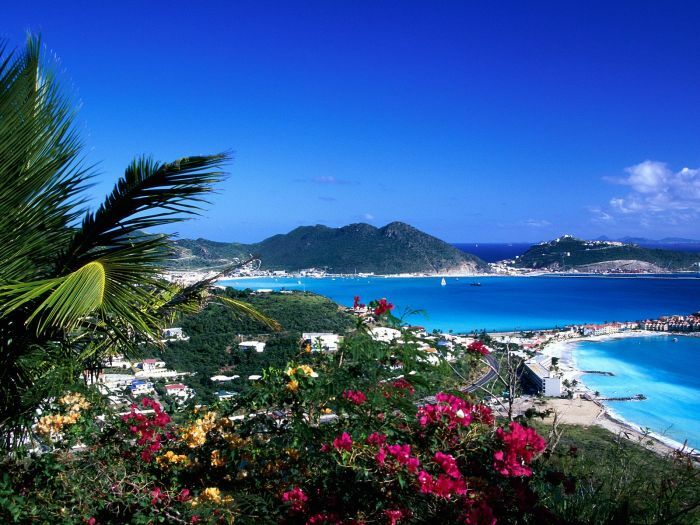 St. Maarten is a small island in the northern Lesser Antilles, east of Puerto Rico and the Virgin Islands. The island is divided by 2 countries. The Dutch side, Sint Maarten, and the French side, Saint Martin. The north eastern side is on the Atlantic Ocean and the south western side is on the Caribbean Sea, which does effect the growth of different flowers and plants. Many of the same flowers we enjoy here in the Tampa Bay Area grow in St. Maarten, such as Lantana, Hibiscus & Oleander and they are everywhere! On a tour we learned that the island claims a National Tree which is known as The Flame tree or the Royal Poinciana. It is originally from Madagascar and grows throughout the Caribbean. The tree symbolizes emancipation and blooms from June to September with beautiful red, orange & yellow blossoms. There were plenty of different cactus plants that lined the roads and they grew all over. One thing that cannot be denied about this Caribbean island, no matter the Dutch or the French side… it is a beautiful place to visit. Now go out and have yourself a wholesale flower-filled, vacation kind of day! Party It Forward… The Movie! As always, we are so happy that our Party It Forward Event Shows are so successful, and this one was no exception! This last one was at the beautiful Quail Hollow in Wesley Chapel, FL. Their grounds and venue are a beautiful backdrop to anyone’s event! Our vendors and sellers were fabulous and we thank each and every one of them for participating, as well as, all our brides and future event hosts who came out to see what it’s all about. Sit back and take a peek … maybe next time you’ll come out and see how great these shows really are! If you missed this past show, never fear… another one is in the works and we’ll keep you posted for the date & location. The “Party It Forward©” concept puts you together with past hosts of celebrations who had beautiful items and no longer have a use for them. The things they no longer need will become your treasure trove. Now, go out and have yourself a flower-filled, wholesale day!